Are you someone who struggles to get through Mondays? Are you passionate about mapping, GIS, cartography? Do you want to learn a way to end a regular ol’ Monday with a fun, social and educational party? Since this blog is a safe space and we're all friends here, let me share the secret with you: organize a meetup with a whole bunch of map nerds like yourself plus some of the top mapping companies in the world and geek-out on all-things-maps over pizza. Now that's the way I want to spend a Monday night! So, what did we do? 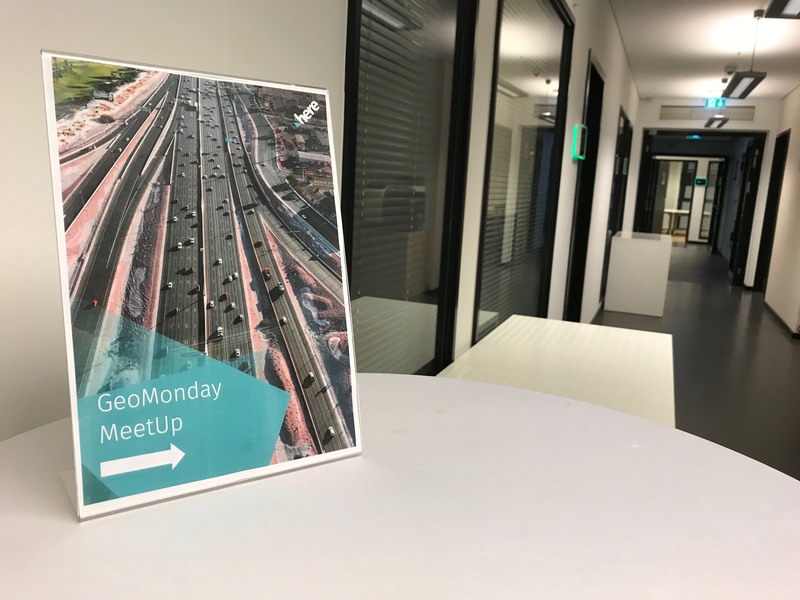 We hosted the 17th GeoMonday meetup at our Berlin office on March 19th. 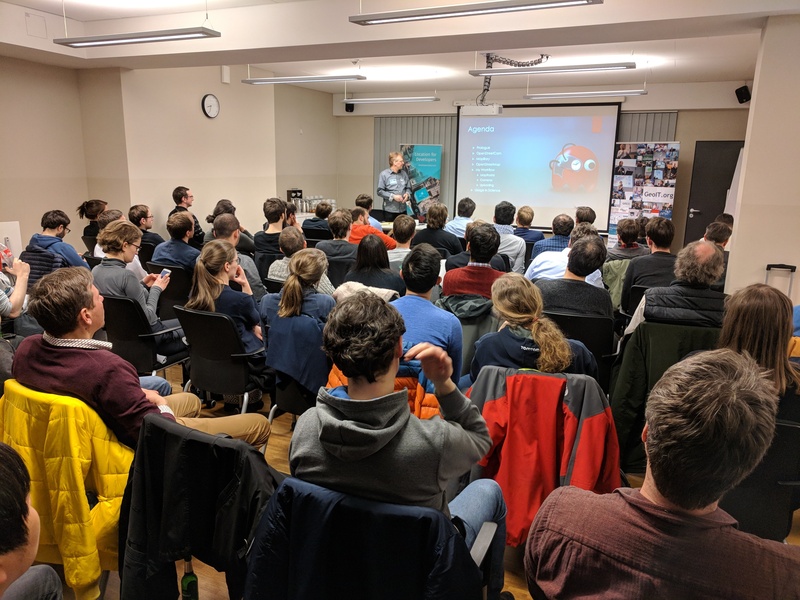 We love mapping, as you might expect, but we weren’t sure how many mappers were in Berlin who would be into map talks and hanging over pizza on a Monday. 66 people showed up at our office in Mitte at 7:00 PM—right after what possibly had been a plain ol’ Monday for them—and we got right to business. Richard, our comically-cynical German evangelist, shared routing for the uninitiated and introduced the Intermodal Routing API, including why anyone should care. (Spoiler: you should care because if you're a commuter, chances are you like having flexibility on your mode of transport depending on the hour, weather, traffic or just your feelings.) He soon was off musing about flying taxis and Hyperloop and how these transport options will be built into routing in the future. Other large-scale mapping tech was also represented. 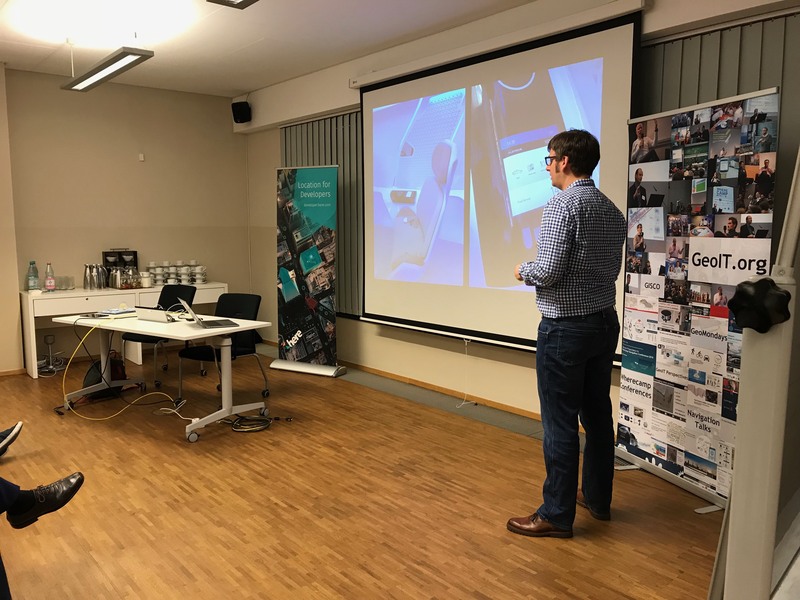 Dr. Falk Hüffner from TomTom talked about On-Street Parking and pitched a model that uses historic data to predict parking probability on time of day and day of week for a given location. That solution tries to provide the best option available by minimizing the driving and walking time. And honestly, who has time to circle the block 5 times to find a spot? Truly a time-saver! It's the era of people who like to take pictures of, well, almost anything, but Thomas Mönkemeier’s talk really hit home for the amateur photographers in all of us. He presented various ways to collect street-level imagery, highlighting similarities and differences between OpenStreetCam and Mapillary. He also shared advice on how to be discreet while taking street pictures, a useful skill for those trying to collect data while avoiding creeping people out. Thomas's pro tip: use a selfie stick to look like a tourist and dodge the weird looks from passersby. We’d like to thank Prof. Dr. Roland Wagner, the initiator of this meetup and president of GeoIT, who helped with the logistics for the group. Now that we know how many folks in Berlin are into mapping, we'll double-down on pizza and beer for the next event. If you want to hear more from us and come to our next meetup, keep following the blog. Also, if you want us to host your big data, mapping, or general tech meetup, just shout at us on Twitter, and we can come to you—we know you want to get your map on! See ya out there, and may your Mondays be full of geeking out over location services.